Why are these White House briefings heard but not seen? That's what the graphic said on CNN as the White House daily press briefing was about to begin on Thursday. The White House designated the Q&A as "off-camera" and, at first, prohibited broadcasting audio as well -- something it has done several times this month. Then the administration said television and radio networks could air the audio, but only after the briefing was over. It was the latest in a series of evasive maneuvers by the Trump administration, leaving journalists fuming and some Trump supporters cheering. The White House did not specify why it decided to forbid television cameras from showing Thursday's briefing. But the Q&A came on a pivotal day for the administration, with deputy press secretary Sarah Huckabee Sanders fielding a battery of questions about Senate Republicans' newly-unveiled health care bill, President Trump's admission that he did not tape his conversations with former FBI director James Comey, and other topics. The White House has only held two on-camera briefings in the past two weeks. The State Department and the Pentagon have all but stopped holding on-camera briefings, too. Some veteran reporters and Washington observers have warned that the reduction in access could, in addition to hurting the public, actually harm both the administration -- hampering its efforts to communicate about Trump and his agenda -- and the press corps. Past administrations sometimes held similar off-camera sessions, colloquially known as "gaggles," but usually as a supplement to on-camera briefings. Trump's press shop has been doing it more often, as a way to limit on-camera opportunities. They added the prohibition on audio broadcasting of some of the off-camera briefings earlier this month. "The nice thing about turning the cameras off sometimes, and I find this, is that it is not 'performance art,' as you call it, that you end up having, I think sometimes, a more substantive discussion about actual issues because they're not trying to get their clip," White House Press Secretary Sean Spicer said on the "Laura Ingraham Show" Wednesday. "They're not trying to figure out, 'How do I get on TV? How do I ask some snarky question?' You can actually focus on the substance of the issues." CNN vividly showed the new restrictions in action on Thursday by broadcasting live pictures from the briefing room until the moment Sanders stepped up to the podium. 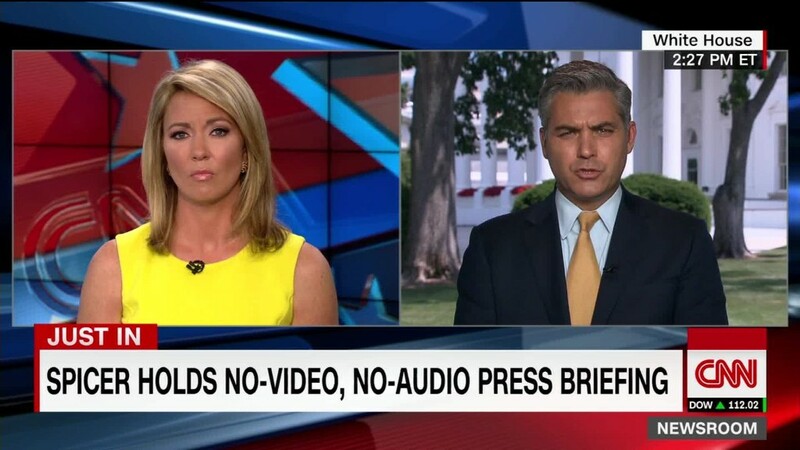 Immediately after the briefing ended, when the White House rules stipulated that the briefing audio was usable, CNN aired the briefing in its entirety. Fox News and MSNBC also noted the unusual arrangement on Thursday. Once the briefing "finishes, we will be able to bring you some of the highlights," Fox anchor Jon Scott said. Both Fox and MSNBC played snippets of the audio with a photo of Sanders on screen. CNN's Jim Acosta, who was outspoken about briefing room tensions earlier in the week, said on Twitter on Thursday, "I'm off today but it must be said that YOUR White House is taking away YOUR right to see and hear YOUR government answer questions today." He acknowledged that off-camera "gaggles" with aides are common, but said, "This is different. It's a briefing without the cameras. Why is that?" Some prominent Trump allies, like Newt Gingrich, have celebrated the White House's "stick it to the media" strategy. Trump routinely assails the "fake news" media, most recently at a Wednesday night rally. He falsely said CNN had turned off its cameras because of booing. But the administration's actions have repercussions for all Americans. By almost every measure, the Trump White House has reduced transparency about the workings of government. Trump reversed the Obama administration's policy of releasing White House visitor logs, for example. CNN's Jake Tapper addressed the matter on Tuesday's edition of "The Lead." "People in power like to hide things from the public," he said. "We called it out under President Obama, and now it is empirically worse and more opaque. You have a right to know what is going on in the people's house, whether related to the Russia crowd that continues to hamper President Trump's agenda or his plans for Afghanistan or tax reform or health care legislation, all of it." John Kirby, a former Pentagon and State Department spokesman under Obama, said in an op-ed for CNN.com that regular on-camera briefings benefit the American government. "In the search for better ways to articulate the President's agenda, the answer shouldn't be no or even fewer briefings. It should be better briefings," he wrote. New York University journalism professor Jay Rosen said he disagreed with Kirby's assertion that the administration is hurting itself by avoiding questions from reporters. "That's true only if you assume that Trump is trying to win the argument, persuade the doubters, or gain the approval of a greater percentage of the public," Rosen told CNN. "What if he's not? In campaigns you can quit trying to reach the undecided and just focus on turning out the base. Trump seems to have taken this approach to governing... It's time we saw the decay in communications as a feature of the Trump presidency, not a bug."